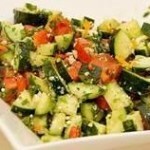 Salat Yisraeli is an Israeli food recipe of finely diced vegetables. 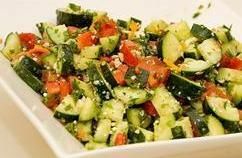 In a large bowl, combine chopped tomatoes, cucumber, green pepper, and parsley. Sprinkle with olive oil and toss. Add lemon juice, salt, and pepper to salad and toss again. Serve.